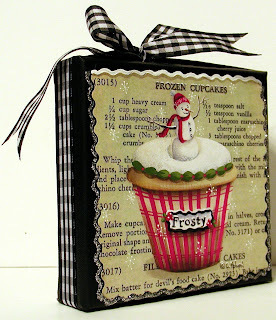 I have so many Christmas and winter cupcakes floating around in my head, so this blog may get a little cupcake crazy! I listed this little painting on eBay this past Thursday. A few weeks ago I purchased an old cook book on eBay titled, The American Family Cook Book (published in 1952) and I found the perfect recipe for this painting. I've included it at the end of this post if you'd like to try it out. The background for this little painting is a recipe from an old cookbook that I decoupaged onto the front of the canvas. Frosty waves from his perch on top of this cupcake decorated for Christmas. Fluffy white frosting mimicking snow, is edged with a border of green piped frosting and red dots. 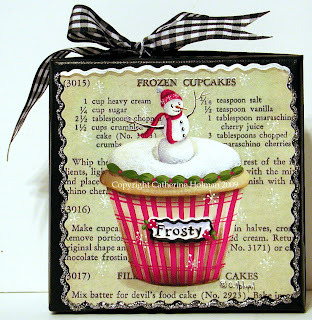 Tiny white snowflakes adorn this scene and silver glitter outlines the recipe. A black and white checked grosgrain ribbon is wrapped around the edges of the canvas and is tied in a bow at the top. Whip the cream stiff and then fold in the rest of the ingredients, lightly but thoroughly. Fill tiny cups with the mixture and place in freezing tray of refrigerator. Garnish with maraschino cherries and candied ginger. Serves 4. Ciao Catherine :) another wonderful work here! I like like like this one and I enjoy the Christmas atmosphere that reigns here from you! ♥ Your attention for little details is great! Have a beautiful week. that's so pretty catherine :)) i love the idea of decoupaging the recipe behind the cupcake!! lovely lovely!! I love the christmas atmosphere and preperations wich are everywere these days. I better try this recipe. I'm heavily into cupcakes this year so thank you so much for yet another recipe, rather than a cookie exchange I'm thinking cupcakes. Absolutely love the painting. 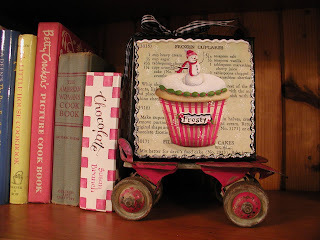 Cathie, that is such a cute cupcake painting and thanks for the recipe! I love snowmen! You have been busy again. I adore your cupcakes. They so real, it makes you want to take a bite!. I always enjoy seeing what you are up too. Wonderful painting Cathie! The cupcake recipe sounds delightful too! Another beautiful cupcake painting! And what a great and unique recipe to go w/ it!! That painting is so cute! Have a wonderful Thanksgiving sweet friend! Oh, I really love this painting! So cute for the winter! I love all of your cupcakes!